Welcome to the E.A.D. Designs weekly Monday hop! You should have arrived at my blog from the E.A.D. Designs blog, if not, please start the hop there! Today is a fabulous day! I get to giveaway some E.A.D. Designs rub-on vinyl to one lucky blog hop participant!!!! So make sure to leave a comment on each stop on the hop, including the E.A.D. Designs blog to be entered into the random drawing! My project today uses the E.A.D. 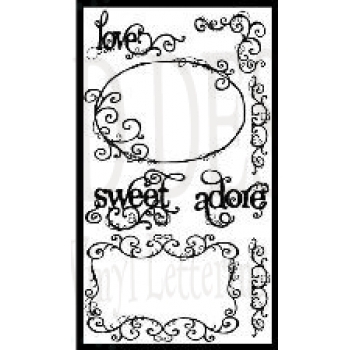 Designs Adore Frames vinyl rub-ons which is my giveaway today!!! E.A.D. Designs makes the BEST rub-ons on the market! They are not like regular rub-ons, these are vinyl and oh so cooool!!! Extra products used on my layout: BoBunny Jazmyne dp, chip stickerz, bling and buttons, u/k bling, Permaball journal pen, staples, Colorbox Chalk ink and Websters trim. And here's a peek at my giveaway! LOVE the rub ons....GREAT layout Stephanie! Super sweet layout! I love the purples! I agree - EAD's rub-ons are AWESOME. Your layout is beautiful - I love the flourishes! Very sweet layout--love the frame. this is so pretty! I love the florishes with the 3D elements! So lovely! I'm partial to all shades of purple so it's extra beautiful! Wow, love your layout! Those vinyl rub-ons look amazing!